The Hoard Increases – An update from Adam ‘n’ Lisa – a return visit to their hoard site reveals even more coins. Calamities and Cartwheels – David Stuckey and Julian visit their Georgian manor house site on a dramatic day including farm fires, plane crashes and some interesting finds! My Love of Celtic Coins – Liz Cottam explains just what it is she loves much about Celtic coins. 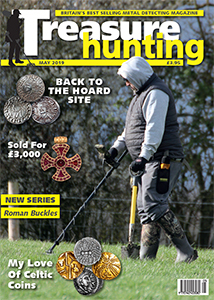 My First Year Detecting – Inspired by the BBC’s ‘Detectorists’ Mark Westaway recounts his adventures during his first year in the hobby. Roman Buckles – A new series from Stuart Laycock starts with a look at the history of Roman Dolphin Type buckles. Fields of Gold – Golden crops, gold rings and a gold stater are on the agenda for Alison Harrington this month. Introducing the Finds Liaison Officers – This month’s article features Simon Maslin, FLO for Surrey. Sharing the Load – Charles Abbeyville discusses the pros and cons of detecting partners.